I originally shared this idea back in 2015, but as God continues to show us more about loving others, I wanted to bring back the idea again this year. Truly this is a very practical but fun way to bless people in need this winter! I picked up several pairs of fun Christmas socks before Thanksgiving, so as expected, I bought some toothpaste and pencils to go with them. 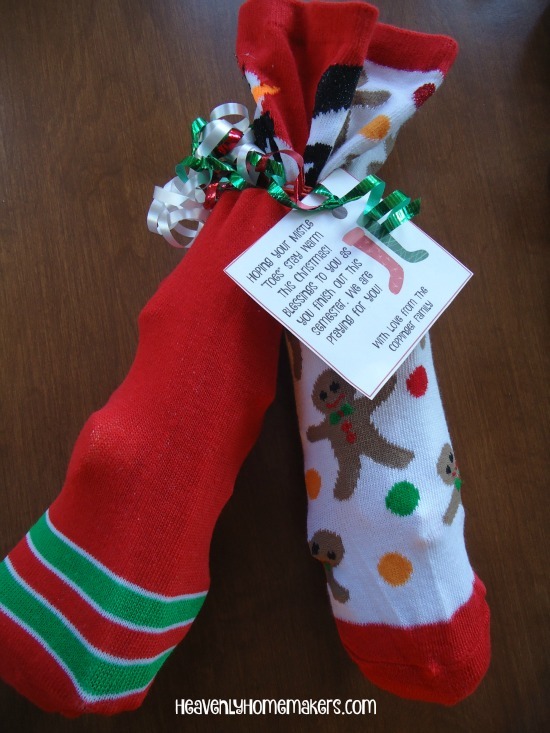 This is the obvious action to take when gifting Christmas socks. Everything I do is normal. These gifts were terrifically fun to put together! 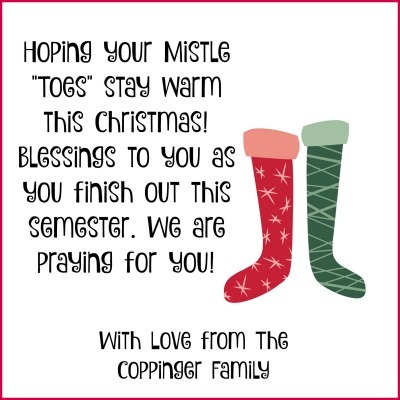 I went with basic wool socks for our three male adopted students, as you’ll see below. Since I’d gotten so many pairs of fun girly Christmas socks on sale, I decided to mix theirs up a bit. While it looks like they’re receiving mis-matched pairs, I actually rolled up the second sock of each pair and stuck it down inside the toes. So the girls are getting two pairs of cute socks. Sorry boys – yours are much more practical! Speaking of practical – I included a few other practical items inside the guy’s socks. What college student wants to actually spend money on toothpaste and soap? Not to worry, I’m here to help. Their socks included soap, toothpaste, pens, candy cane chapstick, a small flashlight, gum, and candy (because not everything must be practical and at least I included toothpaste to brush away the sugar). The girl’s socks were a little more on the fru-fru side because my inner girl rarely gets to come out in this household of men and all that I’d been holding back exploded in the dazzling Christmas aisles at Walmart. I got the girls sparkly lip balm and glittery nail polish, Christmas nail files, snowman pencils, face scrub, gum, and candy. I then created a generic tag for all of you in case you’d like to steal this idea. A great way to bless people in need! This time of year is so much fun! Subscribe for FREE to Heavenly Homemakers so you won’t miss all the new Simple Recipes and ideas we share to save you money! I love this idea!! Takes “Christmas stockings” to a whole new level! So glad that you re-shared this idea! I love your family’s heart for others! Thank you so much for this idea! We used it for my 10 yr old daughter who wanted to buy presents for her 5 friends but she had to use her own money. We went to the dollar store and got each of her friends a fun pair of Christmas socks and filled them each with four goodies plus the matching sock. This made a $5 gift seem like a lot more and she stayed within her budget! 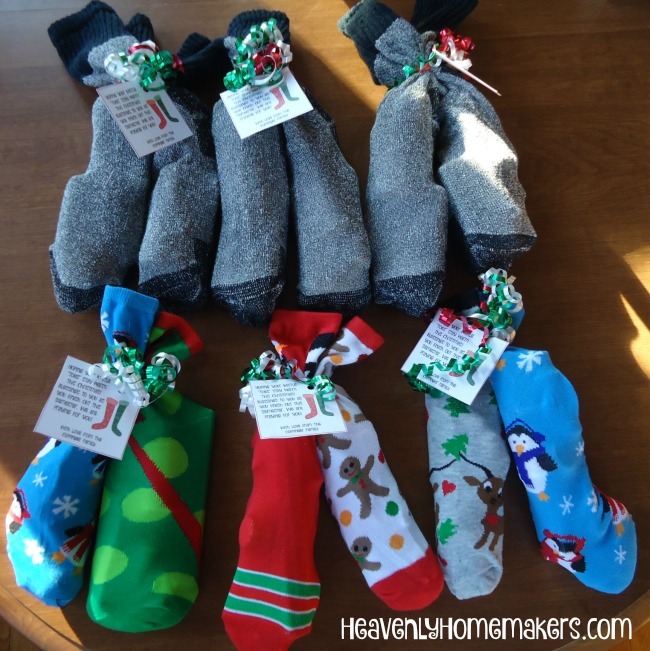 She had so much fun filling the socks and even made tags that said, “I hope this gift knocks your socks off!” ?